Pollsters, Molesters (accused), and Whitmer – Oh My! 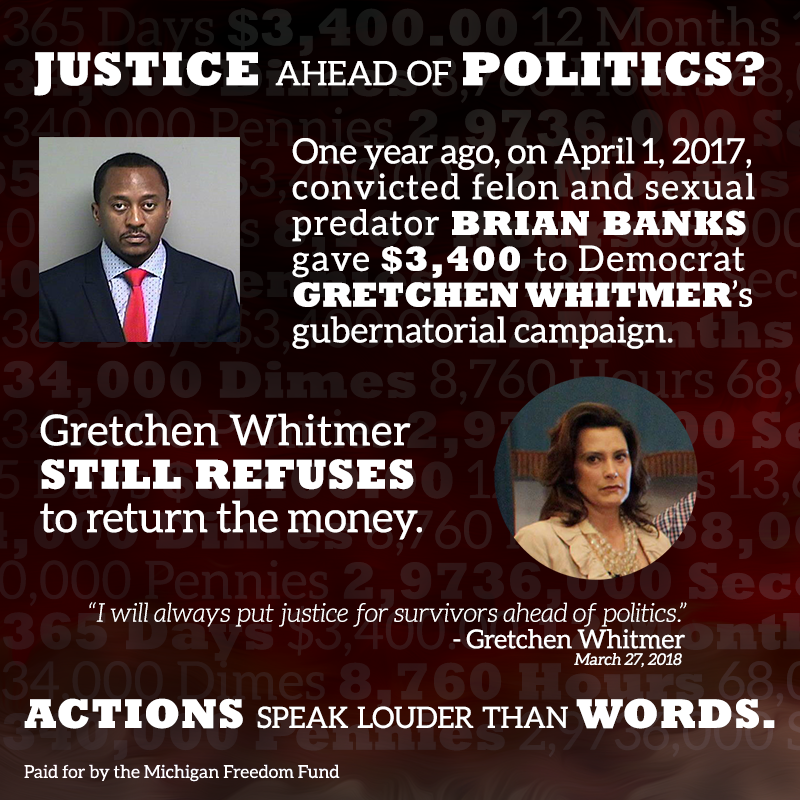 Gretchen Whitmer refuses to return thousands of dollars in campaign contributions from her former legislative colleague, Brian Banks, a Detroit-area felon sued by a state employee for molesting him in a Lansing hotel room. We might finally have a clue why. Whitmer needs the backing of prominent Detroit politicians like Brian Banks to win her primary… and things aren’t going so well. Yesterday, pollsters at Marketing Resource Group (MRG) released the results of their latest survey and they’re stunning. Whitmer, according to the poll, is now trailing little-known businessman Shri Thanedar statewide for the Democratic nomination, and, more importantly, she’s running a distant 3rd place in the City of Detroit. In Detroit, Thanedar is taking home 27 percent of the vote, Abdul Al-Sayed 14, and Whitmer only 9! Could Gretchen Whitmer really be embracing a disgraced felon accused of sexually harassing and forcing himself on his state employee to avoid slipping further behind in that lawmaker’s district? We hope not. Then again, we’ve hoped for months she’d do the right thing and distance herself once and for all from the accused sexual predator, and that just hasn’t happened.